Drones could soon be dropping off packages at customers' doors. But researchers in Sweden have drones in mind for a different, potentially lifesaving delivery: automated external defibrillators. Using drones to carry AEDs to people who are in cardiac arrest could reduce the time between when patients go into cardiac arrest and when they receive the first shock from an AED, the researchers say. The more time a person spends in cardiac arrest before being shocked with an AED, the lower the chance of survival. Shocking someone within three minutes gives them the best shot. More than 350,000 cardiac arrests happen across the U.S. in places other than hospitals each year, according to the American Heart Association — and a person's chance of surviving is about 1 in 10. Drone-delivered AEDs beat ambulance trip times to the scenes of cardiac arrests, the researchers say in a letter published Tuesday in the Journal of the American Medical Association. Dr. Michael Kurz, an associate professor of emergency medicine at the University of Alabama-Birmingham and an American Heart Association volunteer, sees the potential for AED-carrying drones to help save lives. He says this is the first time he has seen published data on the use of drones to deliver AEDs. "This is a really neat, innovative method to combat a problem that we have been struggling with for decades," says Kurz. "It's the same reason we have public access to defibrillation. Airports, casinos, large public venues have AEDs on the wall because presumably, it would take a while for EMS to get there. This is, like, public-access defibrillation on steroids, where we just bring the defibrillator to you." 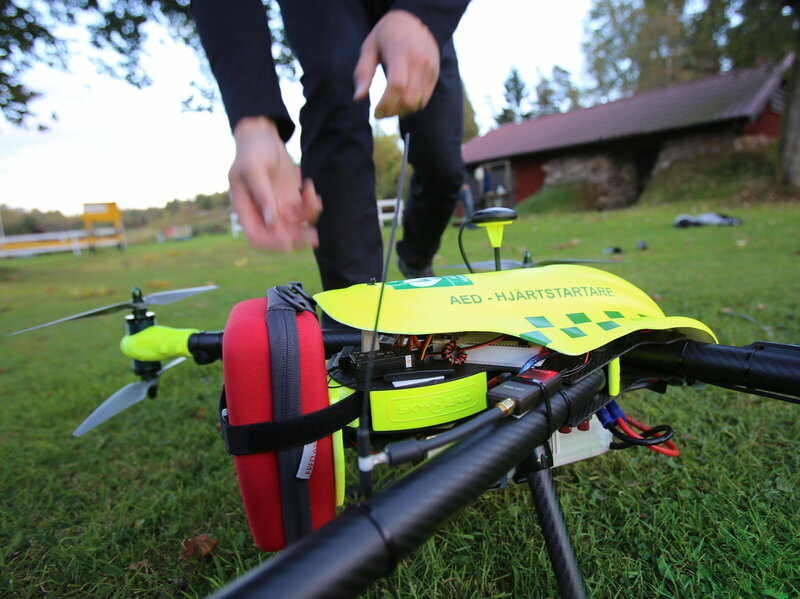 The researchers used drones to deliver AEDs to places in a rural area of Sweden where people had gone into cardiac arrest between 2006 and 2014, says Stockholm-based Andreas Claesson, the letter's lead author as well as a paramedic and registered nurse. In each of the 18 flights that the drones made, they beat the ambulance time. The median reduction in response time was about 16 1/2 minutes. And the median time from dispatch to drone launch was three seconds, while it took emergency medical services a median time of three minutes to hit the road. Even though there wouldn't necessarily be a medical professional on-site when a drone bearing an AED arrives, dispatchers could coach people through the process of using it. Claesson says the idea to use drones to drop off AEDs came from an analysis that showed some people in rural Sweden had to wait about half an hour for EMS to arrive on the scene of an out-of-hospital cardiac arrest situation, leading to a survival rate was 0 percent, which he calls "catastrophic." The team used geographic information system mapping to pinpoint locations that would be most effective for the test flights, Claesson says, and drafted predefined flight corridors that avoided flying over residents' homes until the drones were about to land in yards. But more research needs to be done before we start seeing AED-laden drones touching down at cardiac arrest scenes. "We know nothing about bystander interaction," says Claesson. One of his concerns: Sending an AED via drone means that there won't necessarily be a medical professional on-site. The typical cardiac arrest patient is a 70-year-old man, he says, which means spouses — who may not be trained how to use an AED — would most likely be the ones using it in an emergency situation. But dispatchers could help coach people through the process of using an AED, Claesson says. 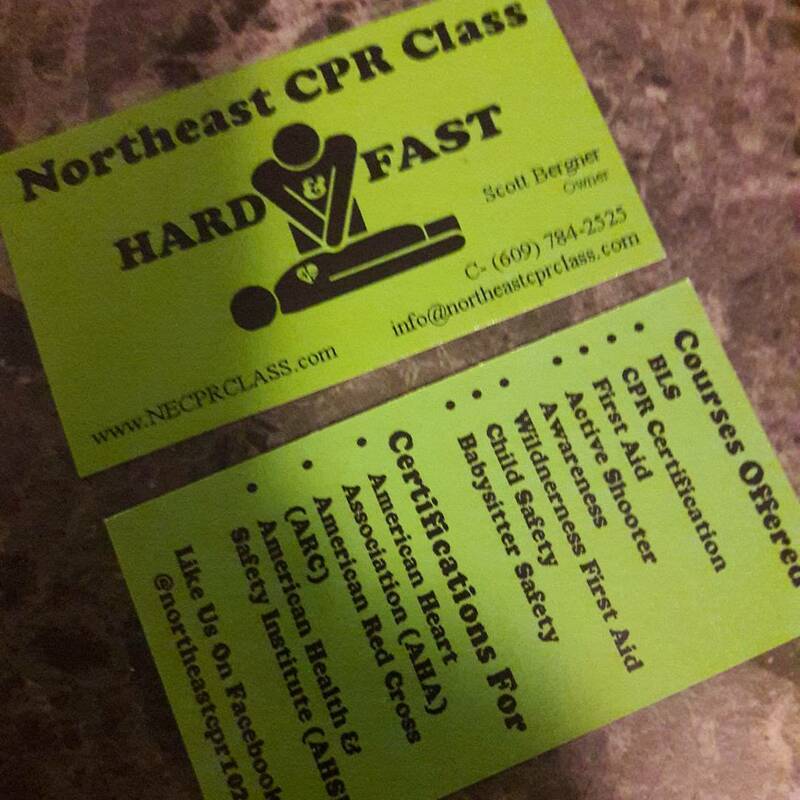 "We know that health care professional CPR is better than layman [CPR]. But we still believe that if we can deliver a defibrillator within five minutes, the proportion of people with shockable rhythms could be pretty high," Claesson says. AEDs have simple enough instructions that allow just about anyone to figure out how to use them effectively, says Kurz, whose daughter has a congenital heart disease and is in fourth grade. "They're fourth-graders, so there's a certain amount of corralling that has to occur, but yeah, they do great," Kurz says.He taught 400 of her classmates how to do CPR and use AEDs this year. Are you as AED-capable as a fourth-grader? The Red Cross has a step-by-step guide to using an AED. Claesson is planning a follow-up drone trial in Sweden next summer, when the local emergency medical services receive the most calls. Kurz says future studies should go beyond analyzing response times and also examine patient survival rates. "Now the idea of doing this in real life with real patients, when minutes matter, can be demonstrated." The National Safety Council has released preliminary figures on motor vehicle fatalities in the U.S. which indicate that 2017 was the second consecutive year that motor vehicle deaths topped 40,000. “[M]otor vehicle deaths dipped slightly – 1% – in 2017, claiming 40,100 lives versus the 2016 total of 40,327. The small decline is not necessarily an indication of progress as much as a leveling off of the steepest two-year increase in over 50 years. The 2017 assessment is 6% higher than the number of deaths in 2015. If the estimate holds, it will be the second consecutive year that motor vehicle deaths topped 40,000. Simply by virtue of being out on the roads more, those who drive for a living must be especially vigilant in following the best practices of defensive driving. Summit Training Source offers a number of courses to help employers better prepare their drivers to stay safe behind the wheel. A passenger vehicle version of the PACE course is also available. This course reinforces the importance of safe choices on the road by teaching skills and techniques that enable employees to recognize and reduce hazards. For more information on these and all the courses in the extensive Summit library, click the button below. The current flu season is grabbing headlines at the regional and national level, as medical groups and hospitals continue to report record numbers of cases. 48 states are reporting widespread flu activity for strains including Influenza A H3N2, H1N1 and Influenza B. What might be simply a few days of inconvenience for many people can turn deadly for sensitive and at-risk groups, where influenza may lead to serious illnesses like bacterial pneumonias. So it’s up to all of us to be good citizens and practice good precautionary measures. A special shout-out to our emergency care instructors: Be sure to disinfect your manikins and all your training equipment after each class. There are still a few more weeks of flu season. Help us keep our communities, schools and workplaces safe: stay home if you are sick, get a flu shot and keep those hands clean and your sneezes to yourself. Your family, friends and coworkers will thank you! Be sure they know what 9-1-1 is, how to dial from your home and cell phone, and to trust the 9-1-1 call taker. Make sure your child is physically able to reach at least one phone in your home. When calling 9-1-1 your child needs to know their name, parentâ€™s name, telephone number, and most importantly their address. Tell them to answer all the call takers questions and to stay on the phone until instructed to hang up. Babysitting is usually a teenager’s first attempt at building and running a small business. Child and Babysitting Safety (CABS) course comes in a magazine-format guide designed to engage and inform the aspiring babysitter. It gives teenagers everything they need to know, from getting started, to dealing with parents and children, to key safety, caregiving, and first aid tips. Course Highlights are: Babysitting as a Business, Leadership, Basic Caregiving Skills, Safety and injury prevention, Play Time, First Aid, Adult Child Infant CPR & AED. This course is usually completed over a 1, 8 hour day but does have the option of a 2, 4 hour day course. The targeted audience is ages from 11 to 15 years old. It would be beneficial for young people (11 to 15 years old) who are interested in providing babysitting services. The ASHI Child and Babysitting Safety (CABS) training program is designed to focus on supervising, caring for and keeping children and infants safe in babysitting settings. The program provides fundamental information in the business of babysitting, proper supervision, basic care-giving skills and responding properly to ill or injured children or infants.